7-Zip is one the best freeware and open source compression utilities so far. I use it a lot when I don't want to install a software and poop into my registry. 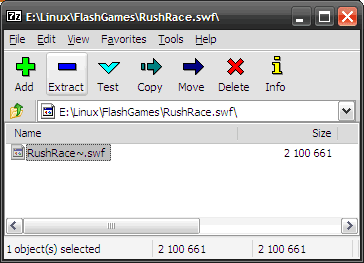 Plus it works with any EXE and DLL file so you can look inside the program resources. 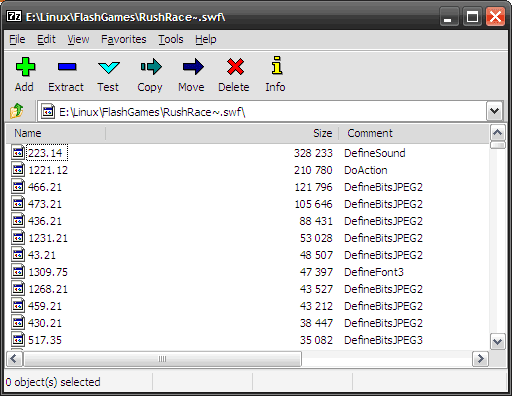 Also I randomly figured that new 9.15 Beta and older 9.x series works nice with extracting SWF and FlashVideo files. The comments always helps to see what's inside. After extracting a audio file it was a acc file inside,but no player worked with it. Somehow headers was messed up. But the behind.audio.flv worked just fine. The easiest way to extract audio from Youtube movies is download FormatFactory . It's freeware and the best converter I found. Works just fine when you need to rip a DVD into single iPod video file. Simple download a SWF file and open with 7-zip.